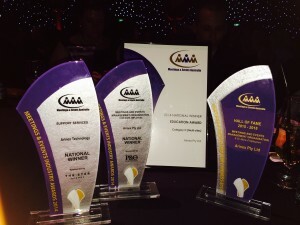 Arinex has made a return to MEA’s coveted Hall of Fame after winning Meetings and Events Management Organisation (8 or more employees) for the third year running at the MEA National Awards Dinner, held on Tuesday 26 May 2015 in Hamilton Island. This marks the sixth consecutive successful entry after serving in the Hall of Fame from 2008 – 2011. Arinex Technology was also proud recipients of the Support Services award which recognised Arinex Technology’s Online Abstract & Program Management system, eOrganiser. eOrganiser is designed to streamline and automate end-to-end program management, moving seamlessly between submission, review, and drag and drop program creation, substantially reducing time involved for all parties. Arinex was also awarded the Education Award, recognising commitment to staff training and development.